Your invitation card is the first impression you make on the guests who will share your special day with you. The perfect beginning to your dream wedding is the perfect wedding Invitation card. Today, wedding cards come in various shapes, sizes and designs with photographs and poems printed and are colourful, exquisite and unique as can be. You could use your creative flair and design your own invitation card and get estimates from printers. Alternatively, if your budget permits, you could entrust the entire job to an artist or an artist's agency and save yourself all headaches. A range of designs from traditional to contemporary, colours from pleasing pastels to earthy and vibrant, paper from handmade, banana fibre, silk-laid to imported art card, motifs from Ganesh to cards using mouli thread and real supari can be found. The rates of cards can range from 3 Rs to 10Rs per card for simple ones to the more elaborate ones which can go from 50 to 75 Rs per card. If the same number of guests are not being invited to all the ceremonies, have different cards for every different function. This will help you plan your guest lists as well. 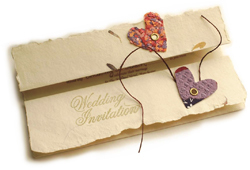 The wedding invitation can be organised in a number of formats. However the following important information must be included such as the fact that it is a wedding event, the name of the hosts, the name of the bride and the groom, the date and the year, the time, addresses of the venue for various ceremonies, RSVP with addresses and phone number. Make sure you order extra invitations in case you decide to increase the number of invitees later, and also some to keep as mementos. Order a few extra envelopes, to allow for damages or for errors in writing of addresses. Order all the invitations at the same time. Placing to small orders is more costly that one large order.